Transportation Secretary Anthony Foxx recently recalled that, when he looked out from the backyard of his grandparents’ Charlotte, North Carolina, home during the late 1970s and early 1980s, he saw a fence two blocks away that bordered Interstate 85. And, if he ventured out of the house and turned right at the corner, he saw Interstate 77. Painting a picture of how local and federal policymakers shaped his understanding of what existed beyond his childhood home, Foxx told a group of mayors and transportation officials—gathered in January for the Transportation Research Board annual meeting—that the goings and comings of unknown people, passing through but never stopping in his neighborhood, delimited his community and warped his view of the world. Foxx grew up to become mayor of Charlotte, where he participated in high-level policymaking about transportation in his city. Now, as the nation’s top transportation executive in the Obama administration, Foxx wants to do something to ensure that communities aren’t destroyed by policies that place a higher priority on moving cars and trucks than protecting people and neighborhoods. 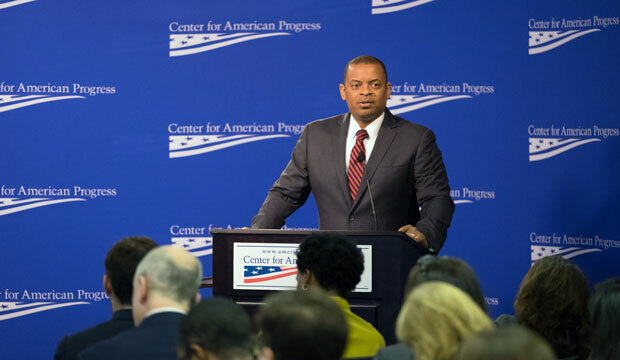 Foxx delivered a similar speech last week at the Center for American Progress, where he outlined an ambitious transportation plan for the 21st century. Since unveiling the federal government’s transportation ideas in a series of public speeches over the past year—which have outlined priorities such as improving bicycle and pedestrian safety, hosting a Smart City competition to encourage communities to use technology in transportation innovation, and providing $305 billion in federal transportation funds to localities—Foxx refined his message at CAP with personal anecdotes and visual aids that illustrated how transportation infrastructure isolated him as a child. In effect, what he saw from his grandparents’ porch has never evaporated from his memory. “We built highways and railways and airports that literally carved up communities, leaving bulldozed homes, broken dreams, and, in fact, sapping many families of the one asset they had: their home,” he said during his appearance. I knew precisely what he’s talking about. I, too, grew up in a Charlotte neighborhood, located less than a mile—as the crow flies—from Foxx’s childhood home. But, as I’m about 15 years older than Foxx, I remember how the construction of those Interstate highways changed the neighborhood that I called home. In the spring, my neighborhood could have been the suburban setting for a Hollywood movie. Dogwood trees opened their buds, unfurling a blazing display of pink and white, while sweet and sticky sap oozed from pines and huge emerald hands sprouted from oak trees. Jimmy Don Arnold, who had the largest and best comic book collection, tearfully told me he couldn’t hang with the fellas any more because the mysterious “They” were tearing down his house. William “Beegee” White’s huge front yard, where we played pickup football games, became a mound of dirt for an embankment to support an off-ramp to I-77. Denise Bellamy’s home—with a script letter B on the façade—was at the end of Fairfield Street, and was the only split-level house in our neighborhood of 130 houses. Faceless bureaucrats and developers destroyed that lovely house to pave the expressway that led into uptown Charlotte. Biddleville Elementary School, where I attended first and second grade—and heard about President John F. Kennedy’s assassination—was no more, gone to make way for the Brookshire Freeway, which connects I-77 and I-85 as it snakes its way into and out of uptown Charlotte. Charlotte wasn’t alone, Foxx said, noting that in nearly all instances of Interstate construction and highway infrastructure development was routed through black or poor communities. Politicians and policymakers viewed those communities as politically weak, which made them ripe for plucking by builders who cared little about the wreckage left in the wake of sweeping construction. During the 1950s and 1960s, the federal government’s urban renewal effort empowered local governments and private developers to develop downtowns and displace the mostly poor residents of color through practices such as eminent domain, where property is seized in order to continue development, with no procedure for relocation. While it’s highly unlikely that Foxx will see the entirety of his transportation agenda come to pass before leaving office next year, he’s working hard to end the discrimination that has blighted governmental policies and the work of urban planners like Moses. That’s a high mark for future transportation officials to follow. Owing to his childhood memories, Foxx’s tenure in Washington has ushered a set of transportation policy attitudes that, hopefully, will remain in place after he’s gone. Surely, it will no longer be de rigueur for local, state, and federal officials to blindly build roads, bridges, and freeways through poor and minority communities without thinking about the effect on those living below the overpasses or out of sight of the exit ramp. If Foxx is successful, he will prevent more children from facing the kinds of limitations that he and I experienced in Charlotte: Future generations of children won’t have their horizons blocked by the ugly views of a transportation system that works for others—and not for them.